There have been speculations that William Shakespeare may have used drugs after an investigation of clay pipes that were found near his house showed traces of narcotics. In the ancient times, opiates were used for medicinal purposes. In Sumeria about 4000 B.C.E., opium was regarded as the ‘plant of joy’ and it grew in places like Persia and ancient Egypt. It is thought that some of the Shakespeare’s work may have been influenced by drugs. During the examination of the 24 pipes it was also revealed that two of them has coca plant traces, however, it is unlikely that Stratford-upon-Avon, England could have had the plant in the 16th century. Coca plant isn’t a native herb for England. Coca leaves, which were used to derive cocaine in the 19th century, came from Peru. The Inca of Peru used coca leaves as medicine and stimulant; however, they may not have been introduced to Europe because the Spanish didn’t have that interest. What was commonly imported during that time is Cannabis sativa, but again, it was mainly used in making ropes and clothes, and rarely, if at all, was it used to make joints. The use of drugs for recreational purposes may be dating back to the ancient times as the Shakespeare’s story tells it, however, another supporting element about drug and alcohol abuse is that of binge drinking during the Tudor times. The Tudors may have been worried about binge drinking and the violence what was related to alcohol use. When you see scenes of drunken people in British towns and streets, you may begin to think that our modern society has loose morals, but this is a phenomenon that existed many centuries ago. Alcohol abuse was so widespread that it prompted a personal intervention by Elizabeth I, who issued a ban on the super-strength drink ‘double double beer’. But despite the ban, her courtiers could still guzzle greater amounts of ale. In 1552, at times of Edward VI, overconsumption of ale resulted in an order that required ‘alehouses’ to get a license. The modern society may be irrational and deceitful with the perception of drugs. The ancient society and communities may not have had problems with the recreational use of drugs, but today, it is a different story. During the medieval and Tudor times, heavy drinking was thought to be part of rural life and people could take weaker bear rather than water believing that water would bring diseases to them. Drunkenness wasn’t so problematic during the pre-industrial time unlike what we see today. However, in the 18th century, urban populations started taking gin in extreme quantities bringing about concerns on the use of alcohol. An indication of moral outrage was seen with the Hogarth’s renowned engraving, “Gin Lane.” The gin consumption problem may have been characterized by increased crime, debt, and prostitution, a situation that culminated to initiation and implementation of the 18th century “Gin Acts.” These Acts are seen as the first legislative efforts to bring control over the use of substances that altered the mind. A similar thing happened with the opium, which was widely used during the 19th century. Psychoactive drugs have been used in many communities and societies throughout history. The substances would be used to ease dreary emotions and physical pain, for pleasure, and to induce religious ecstasy or increase concentration. In a time of Elizabethans in England, most of the recreational drugs came in form of tobacco and alcohol. While there may be no historical literature that talks about the use of drugs, the presence of hallucinogen-derived nutmeg and cannabis in smoking pipes used at that time tends to suggest that people may have gotten high. The alcohol industry in Tudor times seems to have thrived strongly, and this may be reflected by the creation of the now, nonexistence jobs like ale-conner. This was a position that John, the Shakespeare’s father gave to Stratford. The task of ale-conner was to test beer quantity- he did this by pouring the beer over the bench where he would sit in it in his leather trousers. The assumption was that if the trousers the ale-conner was in stuck on the bench, then the drink was considered to be off. With the Tudors, the strong beer was preferred by those who sought to get drunk fast, and that’s what we see today. During that time, it was given names as the “dragon’s milk,” “dagger ale,” or “mad dog.” But the beer was mostly imported and a recent arrival in the community. Pre-contemporary societies of the medieval times may have used mind-altering substances, at least, of some kind without encountering societal condemnation. Papaver somniferum (opium) is said to be native to communities of the southern and central Europe, Middle East, Mediterranean region, and North Africa. Ancient Physicians also prescribed opium to treat many ailments like a cough, diarrhea, and pain. These are examples of how early the use of mind-altering substances may have existed. 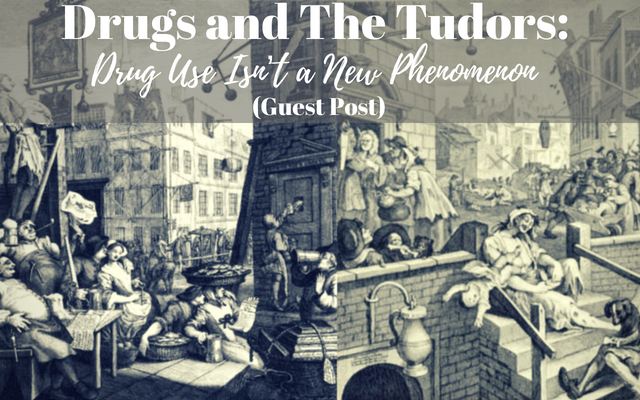 While there may be no much history writing that clearly relates the society of the Tudor times with using drugs such as opiates, there are suggestions that it could have happened. The Shakespeare’s story leaves a lot to be desired regarding the use of narcotics and other drugs.